Are institutions of higher education ready for mobile learning? What factors need to be considered prior to launching mobile learning? The research shows an increasing number of students in developed countries are ready for mobile learning, however, institutions, faculty, and educational delivery systems are not. With the explosion of handheld technology and the pervasiveness of mobile Internet connectivity, greater access is inevitable. With greater access to the Internet, online education has the possibility to engage learners in new ways improving communication and collaboration for educational purposes (Terras & Ramsay, 2012). Readiness includes a variety of factors including pedagogical, budget/support, and instructional materials preparedness on the part of institutions. Prior to exploring the possibility of deploying mobile learning or preparing for delivery in a mobile format, it is critical to understand if students are ready for mobile learning. A readiness study in Malaysia points to the fact that in the second quarter of 2011, there was a ratio of 123.5 mobile phones per 100 inhabitants. 100% of students studied in Malaysia reported that they have a mobile phone and 76% had access to the Internet on their mobile device. Overall the study pointed to the fact that students are ready for mobile learning opportunities (Hussin, Manap, Amir & Krish, 2012). “College students who feel that m-learning is easy to use and useful are more likely to use their mobile device for their coursework” (Cheon, Lee, Crooks, & Song, 2012). Students were more receptive and willing to upgrade cellular phones and service plans in order to take advantage of mobile learning opportunities (Hussin, Manap, Amir, & Krish, 2012). However, not all students have access to mobile learning opportunities, as mobile learning is currently limited in the Asia Pacific region. Despite continued growth of mobile telecommunications in Latin America and the Caribbean mobile learning has a weak presence there. The provision of access is not enough for m-learning to succeed, the skills needed for appropriate use of technology is critical to the success of the educational mission. The lack of literacy in Africa and sub-Saharan Africa are presenting major challenges to learning in general. Both physical and psychological infrastructure must be present for m-learning to be successful (Terras & Ramsay, 2012). In order for institutions to be prepared for m-learning in higher education there are three key considerations: technological, pedagogical, and support/budget. The key technical considerations include the proliferation of mobile platforms and the various operating systems. No longer are there just two operating systems (Mac and PC) as mobile penetration increases now there are several (iOS, Android, Windows, Blackberry, and others). These devices have a smaller screen, must have a different user interface and content structure and they will sometimes have a slower network speed. These must be considerations of mobile platform development so that students can have the best possible learning experience on their mobile device (Nedungadi & Raman, 2012). There are pedagogical implications of authenticity, customization, and social interactivity where time and space are socially negotiated. 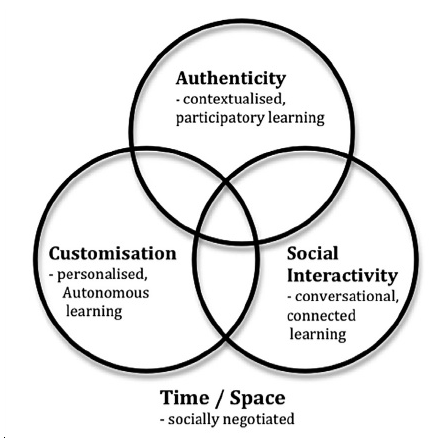 At mLearn 2010 Kearney, Schuck and Burden presented the following framework model. The goal of this framework is to define the critical needs of mobile learning in order to influence the design of m-learning (Kearney, Schuck, Burden, & Aubusson, 2012). In one study, students shifted easily from e-learning to m-learning seamlessly without affecting learning outcomes but state that future enhancements and studies they have planned will take advantage of pedagogical changes and mobile features like location awareness and collaboration (Nedungadi & Raman, 2012). In order to make the most of mobile learning, faculty and instructional designers need to be provided with the necessary support (training, tools, infrastructure) to develop courses that engage learners with this new educational delivery method. This has some budget implications for universities and while m-learning is still quite new there are very few experts to serve in the development of m-learning initiatives.